Elementary and middle school teachers often teach an ESL Pilgrim unit to fulfill social studies and history requirements. These types of lessons are typically taught in the fall to correspond with the Thanksgiving holiday. Students study the settlement of Plymouth, the Mayflower Compact, and other historical events to learn the early history of America from the colonizers' perspective. There are, however, other approaches to teaching a Pilgrim unit that provide a more Native American-centric perspective. A combination of these two approaches is necessary to most accurately portray this important part of American history. 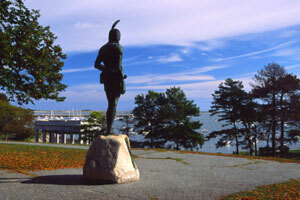 Everything ESL: This unit on settling the Plymouth Colony is designed for third through eighth grade ESL students. It covers important historical topics like religious freedom and self-government. The site lists the materials needed to implement the unit and provides other Thanksgiving related links. It's a very well organized, comprehensive unit on Pilgrims. Molly's Pilgrim Activity: This excellent link is from the University of North Carolina at Chapel Hill's School of Education. The unit fulfills both social studies and language arts requirements as it is designed around reading and analyzing the book Molly's Pilgrim by Barbara Cohen. Students will also do a Venn diagram and complete a cloze activity as part of this exercise. Thanksgiving with the Pilgrims: Designed by Rapides Parish School District in Louisiana, this ESL Pilgrim unit is extremely detailed and comprehensive. It includes activities for social studies, math, health, PE, and English/language arts. Technology resources, materials, rubrics, and procedures are all included. This excellent website will give students true immersion in Pilgrim-related studies for the duration of the unit. Thanksgiving: This very useful unit was designed by teacher Cari Schaffer. It is broken into five lessons, and takes a multicultural approach to teaching this material. A closer look is taken at the Native Americans and their culture during the 17th century. A lesson called Thanksgiving Day 1621: What Really Happened? is designed to challenge students to consider a different perspective on the happenings of the first Thanksgiving. Thanksgiving Lesson Plan: Another great link from Everything ESL, this fantastic unit covers Pilgrims, the Mayflower, Native Americans, and the food we use to celebrate the Thanksgiving holiday. Activity downloads are provided in .pdf format, books are listed as suggestions to help the unit along, and links to other useful resources are included. Designed for first through fourth grade, this unit promises to be a big hit with students. ESL MADE EASY: Designed for advanced ESL students, this resource intends to help students expand their vocabularies through a reading about the Thanksgiving holiday. The words persecution, Pilgrims, harvested, colonists, turmoil, proclamation, and bestowed are highlighted in the context of the reading and are later defined. Even if some of the sites listed above are geared towards a different age group than the one you presently teach, take a close look at them anyway. An idea that is designed for a third grade class can often be made relevant to eighth grade students with a few minor adjustments. "ESL Pilgrim Unit." YourDictionary, n.d. Web. 21 April 2019. <https://esl.yourdictionary.com/lesson-plans/esl-pilgrim-unit.html>.